Home Beers Platform Beer Co. 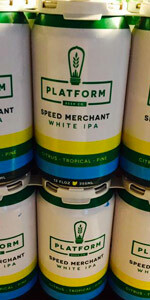 Speed Merchant White IPA | Platform Beer Co.
White IPA with fruity, tropical dry hops. White wheat gives a very pale color. Just enough grain to give it a slight body. I was surprised that an ale with 5 different hop varieties had a clean taste. Usually those many types results in a muddled taste. No bitterness (if you don't like bitter ales). I got this off the single shelf at a Kroger just down the road from south metro ice in Dayton,OH. It poured a clear golden with white head that is leaving some lace. The scent had tropical fruit allure. The taste was nicely balanced and easy to drink with malt forward base and citrus hop finish. The mouthfeel was lighter in body with good carbonation. Overall its a good beer. A: Pours a lightly hazy medium golden yellow in color with moderate amounts of active visible carbonation rising along the edges of the glass and moderate golden honey + burnt orange + medium yellow colored highlights. The beer has a three finger tall dense sudsy foamy light beige head that slowly reduces to a medium sized patch of medium thick film surrounded by a large patch of slightly mottled very thin film covering the remainder of the surface of the beer and a thin ring at the edges of the glass. Significant amounts of lacing are observed. S: Moderate aromas of citrus/grapefruit, citrus/grapefruit pith, tropical/mango, spicy, and pine hops over the top of wheat + cracker + caramel malts with a light amount of caramel sweetness. T: Upfront there are light to moderate flavors of wheat + cracker + caramel malts with a light amount of caramel sweetness. That is followed by slightly stronger than moderate flavors of citrus/grapefruit, citrus/grapefruit pith, tropical/mango, spicy, and pine hops which impart a light to moderate amount of lingering bitterness. M: Just shy of medium bodied with moderate amounts of carbonation. Slightly soft. O: Easy to drink with well hidden alcohol and that slightly soft mouthfeel. Enjoyable with a nice combination of spicy + citrus + tropical + pine hops in the aroma and flavor. Could easily have a couple of these. A: The beer is clear yellow in color with slight hues of amber and a light to moderate amount of carbonation. It poured with a quarter finger high white head. S: Moderate aromas of citrusy hops are present in the nose along with notes of spices and hints of pine. T: The taste follows the smell, having flavors of grapefruit citrus along with hints of pine in the finish, the latter of which gets a bit stronger as the beer warms up. There is a light to moderate amount of bitterness. M: It feels medium-bodied and crisp on the palate with a moderate amount of carbonation. O: This IPA is easy to drink and has a nice balance between citrusy and spiciness/pine in both the smell and taste. Bought in Ohio at a Trader Joe’s. I love how all the grains and hops are listed on the side of the can. Look is a nice bright yellow. Smell is floral with the hops also present. Taste is a bit bitter, but not too bad. Feel is nice, a bit biting but refreshing. Overall it’s not too shabby. White IPA brewed with Chinook, Centennial, Simcoe, Comet, and Citra hops (kudos for putting the grains and hops on the can). Poured from a can into a Fibonacci tulip. The pour is slightly hazy and dark gold in color with a well-formed 2 fingers of fine white foam on top. Good retention. Some pine and cedar on the nose along with a little grapefruit and some fresh bread. Medium body with an oily feel. The beer is quite sweet up front with flavors of fresh toast, honey, and marmalade. Some hops kick in at mid-palate, but not enough to matter or give that wonderful citrus-fruit character that we love about American IPAs. Finishes with notes of toffee, lemon, honey, and hemp. Definitely not worth seeking out. Speed Merchant White IPA from Platform Beer Co.